It is a 2.5 mm sub-mini mono phone plug. (aka 3/32" mono phone plug). Was hoping you'd see this and respond, Don. Knew I could count on you to shake the fuzz out of my memory banks. And a soldering iron in the other hand? Good luck in the repair. 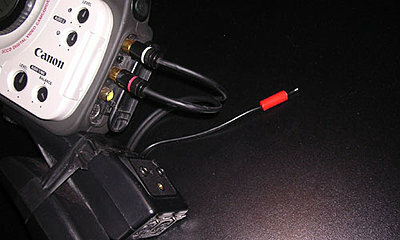 Not sure about the mic wiring, but based on the XL1 body wiring, you may find that the power connector only uses the tip of the connector for the +5 volts, and the ground return is through the common ground lead of the 3.5mm stereo audio plug. The $3.99 fix that saved my shoot. I had been to Radio Shack before and they could not match the plug. But with Don's description I was able to look it up on their website, print the page and take it to them and say this is what I want. "Oh, I guess we DO have that. . ."
Thank heavens, now I can sleep again. Do y'all realize this thread started 6 years ago!? I can be away for a year and pick up where I left off. Ahh, DVInfo - there's nothing like it. Ah ha! Very smart of you, Chris. Now-a-days I have so much to talk about, mainly questions, that I'm overwhelmed and end up just reading instead. 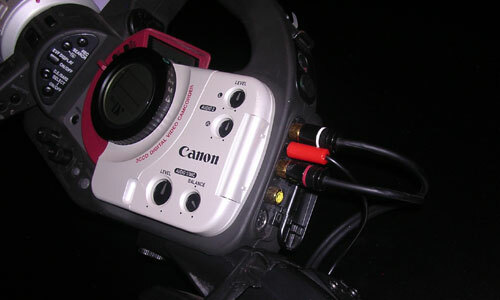 Just recently I bought an MA100 to adapt an AT-897 mic to my Canon Xl-1 through the audio 1 input. For some reason, the MA100 is not outputting to the camera in stereo. During record and playback only one channel can be heard through the headphones. I've connected it with an XLR cable that I use in my home studio, so I wouldn't see why that would be the problem. When you use the stock microphone through the mic input the sound is in stereo. When you plug the XlR into the right input of the MA100, it's only heard out of the right earphone. If you plug it into the left input it's only heard out of the left earphone. The only thing I could think of to fix this is to use an adaptor to connect two XLR cables to one microphone. Or maybe the MA100 is intended to be used with two mics. Either way, that's pretty stupid so it can't be right. Does anyone know what's going on? Or maybe the MA100 is intended to be used with two mics. Either way, that's pretty stupid so it can't be right. Does anyone know what's going on? Bingo. The MA100 provides input connections for two mics, and outputs for the same two mics. A typical configuration is one mic to the left and one to the right channel for stereo or for two channels, depending on your mode of operartion. If you need an external stereo mic, consider the AT-825. If doing mono work you could pan the single mic to both channels in post (that is what most folks will do) , or you could add a bit of weight to you rig and use an "Y" adapter to feed the mic signal to both channels.